We offer you a wide range of transport solutions and logistics services! And we provide all this as a complete end-to-end service! We are specialized in the following countries: Benelux, France, Italy, Austria, Switzerland, Scandinavia and Eastern Europe. As a haulage company the PLC Rainer Bartsch GmbH Internationale Spedition is a trusted partner for various renowned customers in Europe. Our activities are mainly focused on European truck transport. 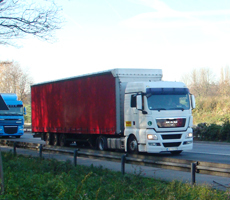 As a haulage company we are also dealing in our own name since 2004-2011. We ensure that your goods are handled in a reliable way and on time! More Information We are always keen to meet the ideas and demands of our customers ..
Our experienced partners ensure a customs declaration of your goods according to the applicable scale of charges..
More Information For more than 25 years we offer our services in all the areas related to customs clearance. You have got the Load - we organize the Transport!